Education Secretary Betsy DeVos made a surprise visit Wednesday to three D.C. public schools to mark the start of the year and celebrate their notable gains on a national standardized test. The elementary schools — Hendley, Simon and Amidon-Bowen — are part of the traditional public school system and serve children who are predominately from low-income and African American families. Devos brought cookies to the school staffs to congratulate them on the test achievements. Shayne Wells, a spokesman for the school system, confirmed Devos’s appearance. An official for D.C. Public Schools said the school system’s central office was surprised by the visit. DeVos did not meet with children. Elizabeth Hill, a spokeswoman for DeVos, wrote in an email that the secretary decided to make “several impromptu back-to-school visits this morning to drop off some goodies and say hello.” Hill said it wasn’t a press event. DeVos frequently makes appearances at U.S. schools, but has drawn some criticism for visiting a large number of charter and private schools. 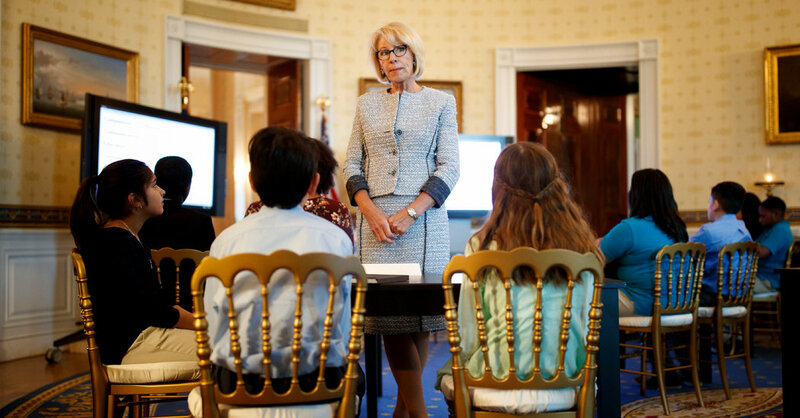 She has said that one of her top priorities as education secretary is to expand school choice, which includes charters and programs that allow public funds to be used for private-school education. In February 2017, DeVos visited D.C. Public Schools’ Jefferson Middle School Academy, where protesters briefly blocked her from entering. And in April 2017, DeVos and first lady Melania Trump visited Excel Academy — an all-girls charter school in the District that has since been shutdown for poor performance. D.C. Public Schools reopened the school this academic year in the traditional public school system. The city made modest gains, but the scores highlighted a vast and persistent achievement gap on the exam between white students and students of color. The three schools that DeVos visited Wednesday were on a list of 33 D.C. Public Schools campuses with passing rates that improved by more than two percentage points on the math and English portions of the exam. While the schools made sizable gains — Simon, for example, went up about 12 percentage points to a 15 percent pass rate in English — they still scored below the citywide average. Citywide, about 34 percent of students passed the English exam and 30 percent of students passed the math portion. Posted in Accountability, Advocacy, Charter School, Department of Education, Every Student Succeeds Act, No Child Left Behind Act, School Choice, School Closings, Students and Parents Protest, Teacher Evaluation, Technology in the Classroom, Testing and tagged "Standing Strong for Public Education", #iBelieve, Accountability, Accountability System, Advocacy, Department of Education, Diversity, Education, Education Funding, English Language Learners, Equity, Every Student Succeeds Act (ESSA), Failing Schools, Federal Education Policy, High-Needs Students, NEAExecutiveCommittee, Pensions, Public Education, School Choice, School Safety, State Budget, Students, Testing and Accountability. Bookmark the permalink.